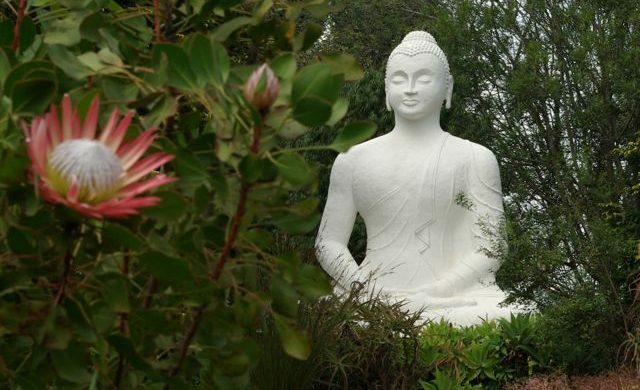 The Buddhist Retreat Center in rural South Africa has been ranked among the top ten on CNN’s “Best Meditation Retreats” list. To visit is to see why. For starters, the BRC has arguably the best vegetarian “table” in South Africa. Think of a lunch of dreamily light shepherd’s pie made with brown lentils, sweetly spiced caramelized baby onions, tenderly crisp roasted veggies and a sprout salad ablaze with orange nasturtiums, much of this picked, fresh, from a bountiful organic veggie garden and what’s not home-grown, brought in from farms in the area. After lunch you might go sit on a rock in a raked Zen Garden to contemplate your navel or life’s mysteries before wandering through a creative bamboo labyrinth, pondering the twists and turns of existence: only to end up feeling that twists and turns are, perhaps, quite simply what it’s all about. Or you could take a long and lazy — or energetic — afternoon hike along pristine walking paths, through indigenous forest and park-like gardens. Gardens that are an Impressionist’s dream when splashed with the biggest and brightest pink and red azalea “trees” you’re likely to see anywhere, plus patches of orange clivia and luxuriously abundant assorted protea. Perched on a ridge at the head of a valley in the Umkomaas river system, (a hop and a skip from the rural town of Ixopo) the BRC was the inspiration for Alan Paton’s scene-setting opening to his long-acclaimed novel, “Cry, the Beloved Country, and is about an hour-and-a-half by road from Durban. 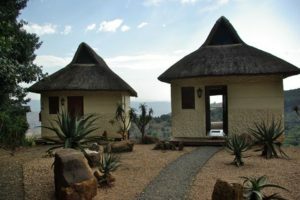 It looks out onto a vista of indigenous valleys, forests and Zulu homestead with patch-worked rolling hills receding like waves to where sky meets land in a distant blue horizon. BRC founder, Dutch-born architect, consulting civil engineer and teacher Louis van Loon, bought the land with the intention of opening a retreat center in 1970. He will tell you, if you engage with him and encourage him to share from his trove of stories, that he became interested in Buddhism in the 1950s while on a trip to Asia. Then in the 1960s, the idea of creating a retreat center in South Africa came while he was lying, feverish and ill, wondering if he would live to see the next morning in SriLanka, during his seven-month pilgrimage around Asia. Once he bought the place, he and a handful of supporters worked for 10 years on the property at weekends, between their regular jobs. They built a lodge with beds for 30 people, a meditation hall, a small teaching studio (now the library) and the kitchen/dining room area. The first retreat was held in 1980 and one person turned up. This was before the age of celebrity Buddhists like Richard Gere. And before meditation became mainstream, seen as an antidote to stress, depression and many other modern-day ills. When I visited for the first time, going on 30 years ago, accommodation was in the original single lodge. Now there are a number of options, including three simple but designer-cool luxury chalets. Then, the landscape was mostly wattle. Now much of this has been replanted with indigenous forest. Then, maybe three people signing up for a weekend retreat was a lot. Now, popular weekend retreats have lengthy waiting lists. Then (in the beginning), the property was pretty decimated. Now, in no small part thanks to the drive and enthusiasm of Chrisi van Loon, Louis’ wife, it has earned custodian status for the habitat it supplies to the endangered Blue Swallow along with National Heritage Site status. Alien trees and plants have been taken out and replaced with indigenous groves and forests. There is a growing resident population of reedbuck and duiker; there are otters and porcupines; and 160 bird species have been recorded. The BRC draws students and teachers from various traditions: Tibetan, with its elaborate and colorful rituals and visualization to the stark simplicity and rigors of Zen and the more gentle and contemplative practice of Theravada, or insight meditation. Over the years it has become a place to go, meditate and learn about Buddhism for some and a great escape for many. 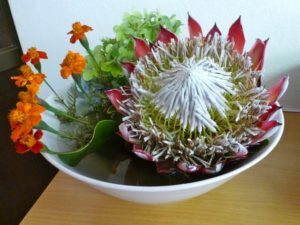 The center attracts many non-Buddhists to courses that range from bird-watching and relationship wisdom to t’ai chi ch’uan, chi kung and yoga. From pure meditation to sketching, cooking, writing and painting. And more and more, people who simply want to explore mindfulness. Small wonder that while it might seem a little off the beaten track, it attracts visitors from around the world. During a recent 10 days visit, one woman arrived by cab in the early evening, having flown to South Africa from Canada via Germany, specifically to spend five days at the BRC en route to participating in a volunteer project and safari in Tanzania. Her plan was to unwind, walk, meditate and experience this place she’d read about online. A young German woman and her Australian boyfriend, on their “Africa adventure,” had heard about the place from friends. They arrived for a weekend retreat eager to learn more about Buddhism and meditation. 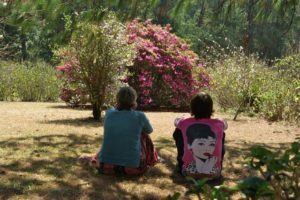 The weekend retreat in question, called “New Year intentions: starting where we are,” run by Lucy Draper-Clarke and Kerri Martinaglia, both on the board of Mindfulness Africa, an organization founded by South African Buddhist teacher Rob Nairn, had a Tibetan Buddhist flavor. “Local” participants had traveled from Cape Town, Johannesburg and around KwaZulu-Natal, which is not unusual. Here you’ll not find designated times of “noble silence” when you’re asked not to chat, quiet places, spaciousness. No schedule pushing you to go, go, go. Instead, time to: be…To read and write, if you wish; to mull and to meditate, to feel nurtured (and that you’re nurturing yourself). These are some of my favorite reasons to head on up there whenever I can. 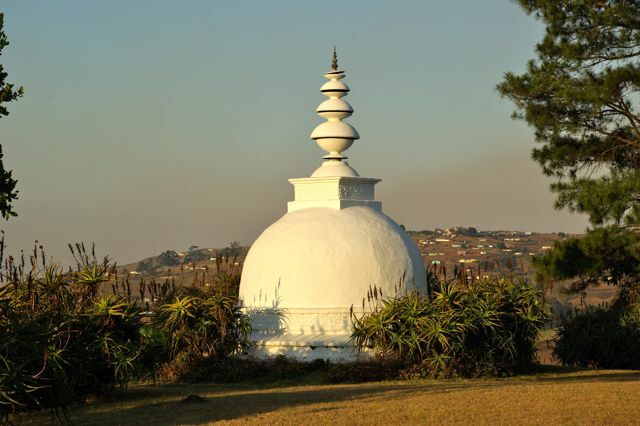 All of the above is before you consider the schedule of classes, perhaps yoga at the stupa or volunteering at Woza Moya, the center’s community focused poverty alleviation, empowerment and HIV-Aids program. Louis van Loon was inspired to make food a focus at the BRC by his visits in the late Sixties to the San Francisco Zen Center’s Page Street City Center and Green Gulch Farm’sGreen Dragon Temple in Marin County. 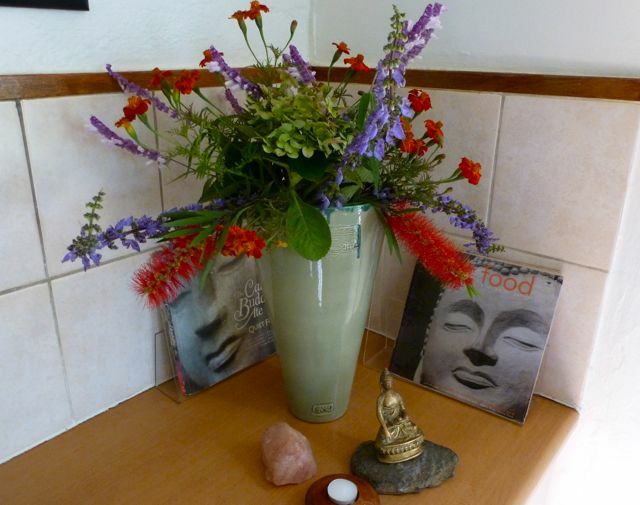 The BRC’s first two cook books, Quiet Food and The Cake the Buddha Ate, both proved hugely popular. 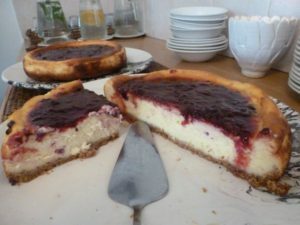 Recently their third cookbook, “Plentiful: The Big Book of Buddha Food”, was added to the culinary library. Louis has also recently added a “Buddha boma,” which includes eight newly planted trees, all of them significant in Buddhist teachings. The idea is that one can do a kind of Indian Buddhist pilgrimage right on the property at the BRC in South Africa. “There’s increasing international interest in the application of mindfulness meditation to achieve greater ease and well-being, productivity and creativity in one’s life,” says Louis, who has run weekend workshops on related topics at the BRC for going on 40 years and counting. Check out the list of upcoming classes and book online through the BRC website. Wanda Hennig is the author of “Cravings: A Zen inspired memoir about sensual pleasures, freedom from dark places and living and eating with abandon,” published by Say Yes Press. It is set, in part, at the Buddhist Retreat Center. The center is located in rural KwaZula-Natal, South Africa. Visit the retreat’s excellent website here: The Buddhist Retreat Center. Ate we able to just pop in for lunch? If so, what days are best? The author suggests you check out the Buddhist Retreat Center website. The link is at the end of the story. You will find their e-mail address and phone number on the website. They do welcome lunch guest but generally not during retreats. Best to connect with them directly to arrange a suitable day to visit as their retreat schedule varies. Thanks for your interest and enjoy!